…in remaining with a detachment of Troop “E”, 7th Cavalry, in a dangerous and difficult position in order to protect against possible mutilation the bodies of soldiers of his command already killed by the Indians…. First Lieutenant Horatio G. Sickel, Jr., E Troop, 7th Cavalry, at Pine Ridge Agency, 16 January 1891. 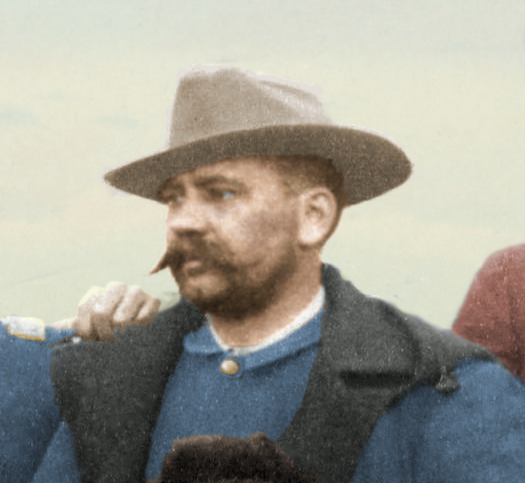 Cropped from John C. H. Grabill’s photograph, “The Fighting 7th Officers.” Colorized by Amy Gigliotti. Two weeks short of his thirty-seventh birthday, Horatio G. Sickel, Jr., was commanding E Troop during the Pine Ridge Campaign while Captain Charles S. Ilsley was commanding the 2nd Battalion. Lieutenant Sickel had served in E Troop for eight years and had been with the regiment since being transferred to it following the battle along the Little Big Horn River just a couple of weeks after graduating from the United States Military Academy in 1876. The troop’s second lieutenant was Sedgwick Rice, a civilian appointee that had been with the unit since transferring to the 7th Cavalry four years earlier. Lieutenant Sickel’s senior non-commissioned officer was First Sergeant Charles M. Clark, a veteran enlisted man with over twelve years in the saddle with the regiment and at least one prior enlistment with the 6th Infantry. E Troop had its full compliment of officers, fourteen of its fifteen non-commissioned officers, and forty-three of its forty-five privates at Wounded Knee, twelve of which were recently assigned from the recruiting depot at Jefferson Barracks, comprising twenty-eight percent of the troop’s junior enlisted soldiers. During the fighting on Wounded Knee, E Troop suffered two men killed and one wounded and lost one horse as well. 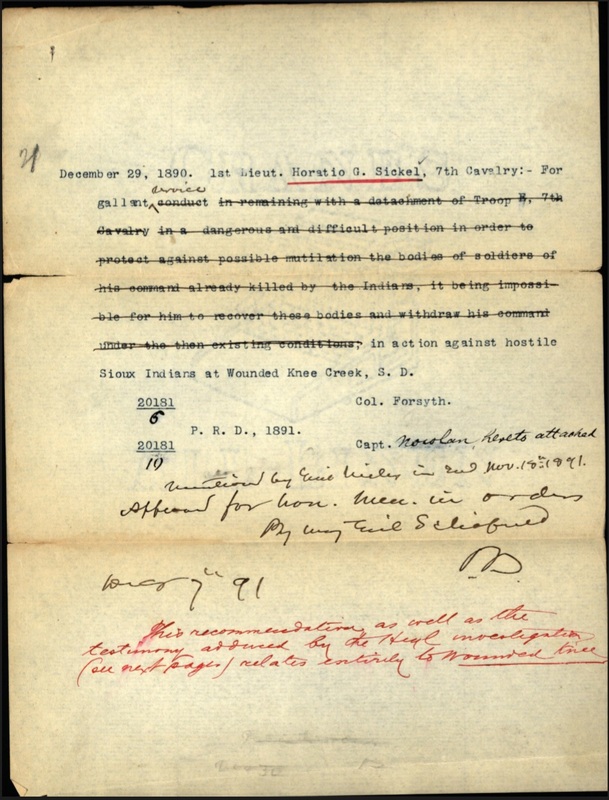 Due to the troop’s operations in the field through the middle of January, Lieutenant Sickel did not testify at the investigation of Wounded Knee. An article in Philadelphia’s The Times, which ran on 9 February 1891, detailed some of the action to which E Troop faced and the measures Lieutenant Sickel took to avoid the unnecessary killing of two non-combatants, measures that ultimately failed to save the Lakota women from their own self-destruction. Following the campaign, Lieutenants Sickel and Rice worked diligently to ensure the recognition of their troopers for actions at Wounded Knee. Their efforts paid off with five cavalrymen from E Troop receiving Medals of Honor–Sergeant A. W. McMillan, Sergeant W. G. Austin, Private M. Feaster, Private T. Sullivan, and Private H. Ziegner–and one with a Certificate of Merit–Sergeant J. F. Tritle. The actions of both officers, however, received little thought until their gallantry was brought to the attention of Colonel Forsyth in the fall of 1891. Writing on 8 October, Captain Henry J. Nowlan commander of I Troop, detailed his observations of Lieutenant Sickel at Wounded Knee. 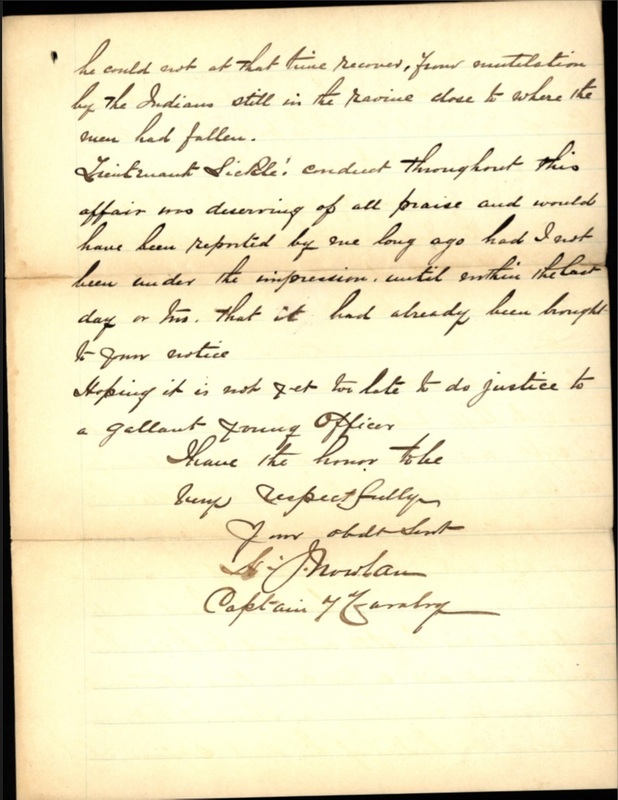 (Click to enlarge) First page of Captain Nowlan’s letter detailing the gallant conduct of Lieutenant Sickel at the battle of Wounded Knee. Sir: Having learned, incidentaly [sic], in conversation with other officers that certain gallant conduct on the part of 1st Lieut. H. G. Sickle [sic], 7th Cavalry in the battle of “Wounded Knee,” S. D., on Dec. 29th, 1890, had never been brought to your notice I consider it my duty and take pleasure in calling your attention to the following conduct which came under my personal observation. 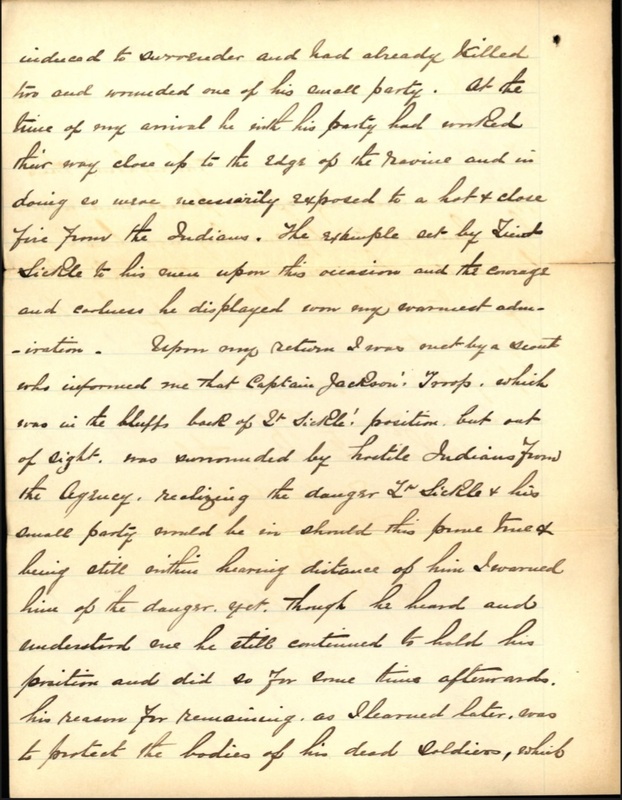 (Click to enlarge) Second page of Captain Nowlan’s letter. (Click to enlarge) Last page of Captain Nowlan’s letter. he could not at that time recover, from mutilation by the Indians still in the ravine close to where the men had fallen. Lieutenant Sickle’s conduct throughout this affair was deserving of all praise and would have been reported by me long ago had I not been under the impression, until within the last day or two, that it had already been brought to your notice. Hoping it is not yet too late to do justice to a gallant young officer. Based on Captain Nowlan and Captain Varnum’s letters and Colonel Forsyth’s subsequent recommendation for honorable mention for both Lieutenants, the conduct of those officers was a point of focus of Colonel Heyl’s investigation of acts of gallantry. During that investigation in the later part of October, Lieutenant Sickel provided the following testimony. Lieutenant S. Rice, second in command of E Troop during the fight, provided greater detail of his troop commander’s actions that day. Lieut. Sickel was in command of Troop “E”, 7th Cavalry, to which I belonged, and immediately after the outbreak at Wounded Knee, our troop was ordered to clear out a ravine in which a party of Indians had taken a strong position in a pocket in the ravine. I think we were engaged there about two hours. Lieut. Sickel, while exercising command of his troop there, was conspicuously brave and gallant in my opinion, by exposing himself unnecessarily to the fire of the Indians and cheering and encouraging his men constantly…. Lieut. Sickel’s conduct throughout the whole engagement was particularly conspicuous. (Click to enlarge). Draft of General Order No. 100 entry regarding Lieutenant Sickel. Born on 15 January 1854 in Philadelphia, Pennsylvania, Horatio Gates Sickel, Jr., was the last of five children. Despite having three older brothers, he was his father’s namesake. The elder Horatio Gates Sickel was also a native Pennsylvanian born in 1817 in Bucks County. He was the son of John and Elizabeth (Vandergrift) Sickel. As a young man Horatio apprenticed as a smith and worked in several trades including as a blacksmith, coach maker, and lamp maker. In 1841, he married Elizabeth VanSant, a twenty-year-old native of Bucks County. Living in Quakertown, the young couple had two children there: Howard VanSant, born in 1843, and Ellen VanSant, the future Mrs. Augustus J. Miller, born in 1844. The Sickels moved to Philadelphia where they had three more sons: Charles Albert born in 1848, William VanSant in 1851, and Horatio Gates, Jr., the subject of this post. Horatio, Sr., also served for two decades as an officer in the volunteer militia such that when the Civil War broke out he was elected colonel of the Third Pennsylvania Volunteers. During his wartime service, he commanded his regiment and a brigade in combat and was rewarded for faithful and meritorious service with brevet promotions to brigadier general and major general. Upon conclusion of the war he was appointed the Health Officer for the Port of Philadelphia. Horatio G. Sickel, Sr., died in April 1890, five years after the death of his wife and eight months before his namesake was called to action commanding a cavalry troop at Wounded Knee. Horatio G. Sickel, Jr., was appointed from the state of Pennsylvania to the United States Military Academy at West Point, New York, and began his cadetship in 1872. He graduated on 14 June 1876 and stood thirty-sixth in a class of forty-seven men. Sickel was appointed to the 14th Infantry Regiment the following day and began his graduation leave. The catastrophe that befell the 7th Cavalry ten days later on the Little Big Horn River had a dramatic impact on promotions and transfers across the Army in order to fill vacancies created by the loss of so many officers. 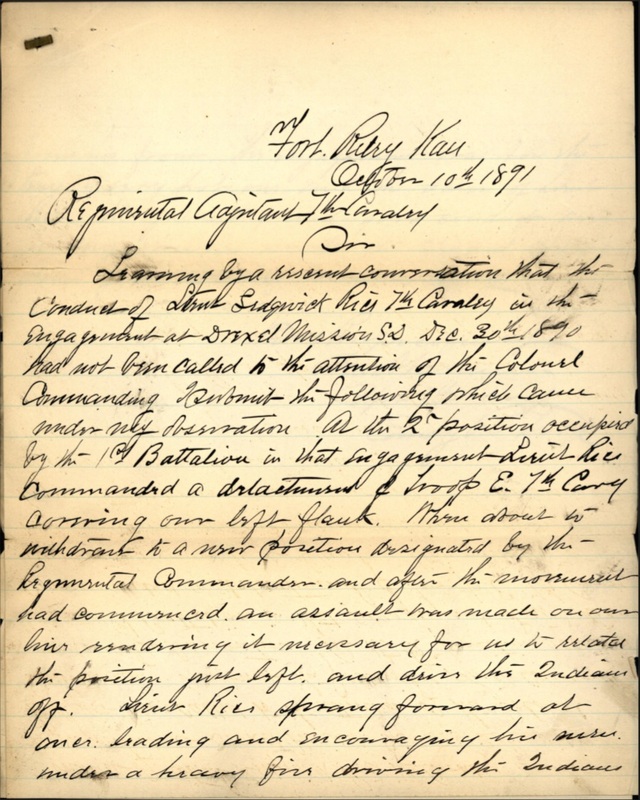 This effect was perhaps best described by General Ernest A. Garlington, a classmate of Sickel’s, who, writing in 1929, detailed the promotions and transfers associated with the 7th Cavalry that summer of 1876. 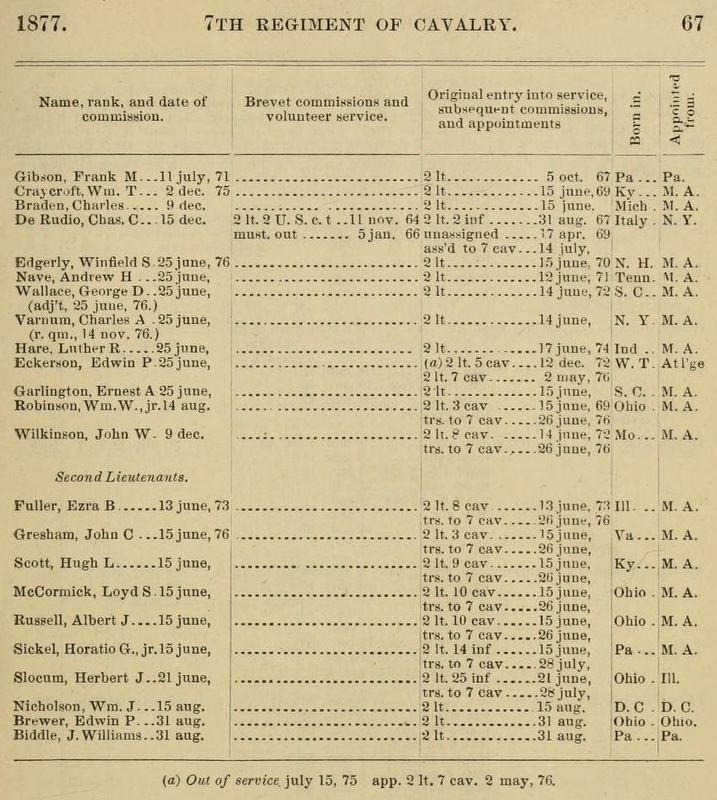 (Click to enlarge) The roster of lieutenants in the 7th Cavalry Regiment listed in the 1877 Army Register shows the significant promotions and transfers that occurred following the Battle of the Little Big Horn. On the 25th of June, 1876, Custer’s fight with the Sioux Indians on the Little Big Horn, Montana Territory occurred. On the 15th of June only one vacancy existed in the 7th Cavalry, to which the writer [Garlington] was assigned. The fatalities in the regiment promoted him [effective 25 June] and left twelve vacancies in the grade of second lieutenant. Certain second lieutenants were transferred from other Cavalry Regiments to these vacancies, but, through regimental esprit, and for other reasons, with three exceptions, these transfers were declined. Whereupon six members of the Class of 1876 were transferred (to date the 26th of June) to the Seventh Cavalry, namely, J. C. Gresham, H. L. Scott, L. S. McCormick, A. J. Russell, H. G. Sickel, and H. J. Slocum, carrying with them the strong bond of friend and comrade established during cadet days which continued unbroken through the many years of intimate association under the old system of regimental promotion. Sickel served with the 7th Cavalry for twenty-seven years, the first twelve at various posts in the Dakota Territory where he participated in several campaigns and scouting expeditions, escorted prisoners, and commanded a troop of Indian Scouts. While stationed at Fort Meade, the thirty-one-year-old cavalry officer took leave in the summer of 1885 and married Miss Mary Louise Jouett in New Orleans, Louisiana, on 5 June. The twenty-two-year-old native of St Louis was the only child of William Robards Jouett, Jr., and Anne F. Schaumburg. She was orphaned at the age of four when her parents died in 1865, her father in late February and her mother in early April. Mary accompanied her husband back to the Dakota Territory where she gave birth to a daughter, Anna. The child died in infancy and was initially buried at Fort Yates in March 1888. Two months later the Sickels removed their daughter’s body and had her laid to rest in the Bellefontaine Cemetery, St Louis, in the same plot where Mary’s parent’s and maternal grandparents were buried. Lieutenant Sickel was stationed with the portion of the regiment at Fort Sill, Oklahoma Territory, in 1888 and two years later at Fort Riley just prior to the commencement of the Pine Ridge Campaign of November 1890 – January 1891. While stationed at Fort Sill the Sickels had a second child, Howard Wright, born in January 1890. The child died of lung and heart disease nine months later about the time that E Troop was relocating to Fort Riley. Mary apparently remained at Fort Sill until after the campaign when Lieutenant Sickel was able to again take leave. They buried their second infant child in February 1891 next to their daughter and Mary’s parents. Horatio and Mary Sickel had no more children. Twice he was detached from the regiment for recruiting duty at Jefferson Barracks, Missouri. Sickel served as the regimental adjutant for eighteen months until his promotion to captain in May 1896, and saw duty with the 7th in Arizona at Forts Grant and Huachuca. During the Spanish-American War, the regiment remained on border duty in Arizona, but soon after was moved to Huntsville, Alabama, then Macon, Georgia before taking up occupation duty at Camp Columbia in Havana, Cuba. Sickel was promoted to major and transferred to the newly formed 12th Cavalry Regiment in 1903 and served his remaining thirteen years in uniform with that regiment. His duties took him to the Philippine Islands where he commanded the military station at Calamba, Laguna, and later the Santa Mesa Garrison at Manila. Returning to the United States, he was posted at Fort Oglethorpe, Georgia, Fort Slocum, New York, and Boston, Massachusetts. Sickel returned to the Philippines in 1909 serving eighteen months at Fort William McKinley. He returned to Fort Huachuca where he was promoted in 1911 to lieutenant colonel and commanded a squadron of the 12th Cavalry. Sickel was promoted a colonel of cavalry in 1912 and commanded Fort Robinson, Nebraska, before taking command of the 12th Cavalry Regiment at Columbus, New Mexico, in 1914. He served his final years at the head of that regiment during the turbulent Mexican Border period that was highlighted by General Pershing’s Punitive Expedition. The Oregon Daily Journal was one of many newspapers across the country that carried the news of Colonel Sickel’s suicide. Colonel Sickel was retired by law on his sixty-fourth birthday in January 1918, and although many of his peers returned to service at garrisons in the United States during World War I, Sickel retired with his wife, Mary, to their home in St Louis, Missouri. Colonel Sickel lost all of his siblings in the few short years before his retirement. His oldest brother, Howard, died in 1912, Charles and William in 1914, and his sister, Mrs. Ellen Miller, in 1915. Perhaps their recent deaths coupled with his failing health led him to desperation, for on 9 September 1918, the retired Army colonel with almost forty-two years of service took his own life when he shot himself in his upstairs bedroom. Photograph of Colonel Horatio Gates Sickel, Jr., circa 1914. His uniform is adorned with the Indian Wars Campaign Medal and the Military Order of the Loyal Legion of the United States hereditary medal. By his classmates he is remembered always as “Tiny” Sickel. The name seemed naturally to belong to him from his earliest days at the Academy, and was used more as a term of endearment than as nickname, in unconscious recognition of the universal affection of his classmates; an affection that increased and ripened until graduation scattered the members throughout the service, and which the separation of after years did not weaken. The later association of the writer with “Tiny,” although long deferred because of difference of service, was particularly delightful. Our first meeting after graduation was in 1903, in St. Louis, at the dedication of the World’s Fair Grounds. It was so short that there was scarcely time for us to recognize each other, after the lapse of twenty-seven years, but it served as a new starting point toward better acquaintance at our next meeting. A few years later found us serving together at Fort William McKinley, P. I., and still later when we were both approaching the retiring age, there were numerous delightful meetings while service together in the Islands, and the later meetings broadened and strengthened our friendship. I learned to know his modest, generous nature that led him always to consider others before himself; to know the high ideals that regulated his daily life and the nobility of his character as a man. 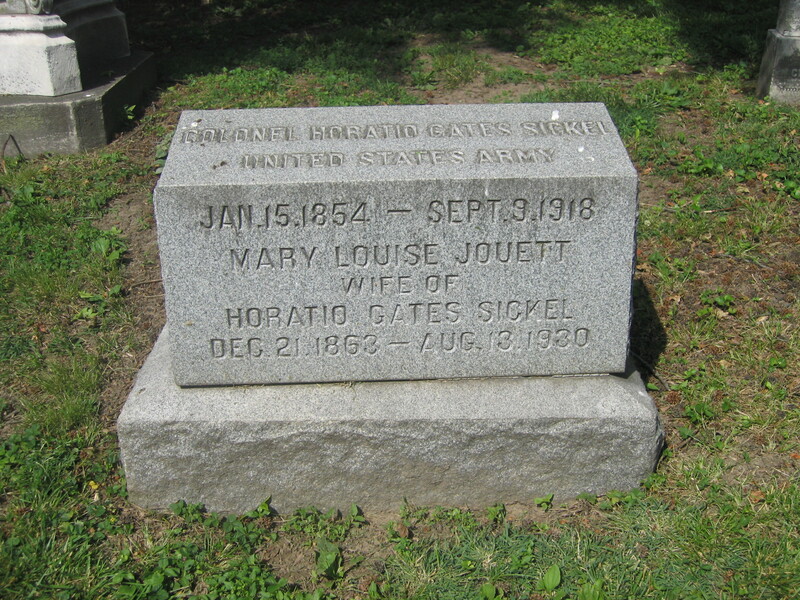 Colonel Horatio Gates Sickel, Jr., was buried in the Bellefontaine Cemetery in St Louis adjacent to his infant children, Anna and Howard, and his wife’s parents, grandparents and great-grandparents. Mary Sickel survived her husband by more than a decade. She passed away on 13 August 1930 and was laid to rest by her husband’s side in a plot surrounded by family. Colonel Horatio Gates Sickel, Jr., and his wife, Mary Louise, nee Jouett, are buried in the Bellefontaine Cemetery at St Louis, Missouri. Adjutant General’s Office, Honorable Mention file for Horatio G. Sickel, Principal Record Division, file 3466, Record Group: 94, Stack area: 8W3, Row: 7, Compartment 30, Shelf: 2. Research conducted by Vonnie S. Zullo of The Horse Soldier Research Service. Samuel P. Bates, Martial Deeds of Pennsylvania (Philadelphia: T. H. Davis & Co., 1875), 844–847; John P. Nicholson, recorder, Register of the Commandery of the State of Pennsylvania from April 15 1865 to May 5 1887 (Philadelphia: Military Order of the Loyal Legion of the United States, 1887), 4; Ancestry.com, United States Federal Census (Provo, UT, USA: Ancestry.com Operations, Inc., 2009), Year: 1860, Census Place: Philadelphia Ward 14 Division 1, Philadelphia, Pennsylvania, Roll: M653_1164, Page: 157, Image: 161, Family History Library Film: 805164; Year: 1870, Census Place: Philadelphia Ward 14 Dist 41 (2nd Enum), Philadelphia, Pennsylvania, Roll:M593_1426, Page: 441A, Image: 367, Family History Library Film: 552925. Association of Graduates, Sixtieth Annual Reunion of the Association of the Graduates of the United States Military Academy, June 12, 1929 (West Point: Association of Graduates, 1929), 231. Herbert J. Slocum was a member of the West Point class of 1876, but was dismissed from the academy for academic deficiency during his final year. He received a direct appointment from the state of Illinois on 21 June, just a week after his former classmates had graduated and received their commissions. Originally appointed to the 25th Infantry Regiment, his date of transfer to the 7th Cavalry was 28 June 1876. George W. Collum, Biographical Register of the Officers and Graduates of the United States Military Academy at West Point, New York, since its establishment in 1802, vol. 3 (Boston: Houghton, Mifflin & Co., 1891), 266. Hunting For Bears, comp., Missouri Marriages, 1766-1983 (Provo, UT, USA: Ancestry.com Operations Inc, 2004); St. Louis Genealogical Society, comp., St. Louis City Death Records, 1850-1902 (Provo, UT, USA: Ancestry.com Operations Inc, 2001), Volume: L, Page: 55, County Library: RDSL 8, Missouri Archive: C 10366, SLGS Rolls: 307; Ancestry.com, New Orleans, Louisiana, Marriage Records Index, 1831-1920 (Provo, UT, USA: Ancestry.com Operations Inc, 2004); Ancestry.com, U.S. Military Burial Registers, 1768-1921 ( Provo, UT, USA: Ancestry.com Operations Inc, 2007), State: Dakota Territory, Page#: 135; Bellafontaine Cemetery Association, (http://www.map.ramaker.com/bca/), accessed 9 Aug 2015. Collum, Biographical Register, vol. 3, 266; Bellafontaine Cemetery Association, (http://www.map.ramaker.com/bca/), accessed 9 Aug 2015. Collum, Biographical Register, vol. 4, 272; Collum, Biographical Register, vol. 5, 248. Ibid., 220 – 221; “Col. 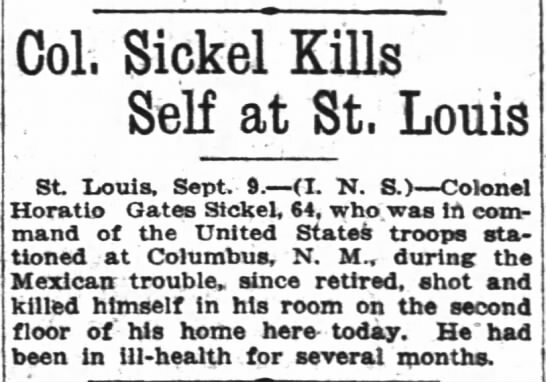 Sickel Kills Self at St. Louis,” The Oregon Daily Journal (9 Sep 1918); “Col. Sickle Ends His Life,” El Paso Herald (10 Sep 1918). Association of Graduates, Sixtieth Annual Reunion of the Association of the Graduates of the United States Military Academy, June 12, 1929 (West Point: Association of Graduates, 1929), 231. Bellafontaine Cemetery Association, (http://www.map.ramaker.com/bca/), accessed 9 Aug 2015. Connie Nisinger, photo., “Horatio Gates Sickel,” FindAGrave (http://www.findagrave.com/cgi-bin/fg.cgi?page=gr&GRid=45427343) posted 8 Mar 2013, accessed 14 Jun 2015. 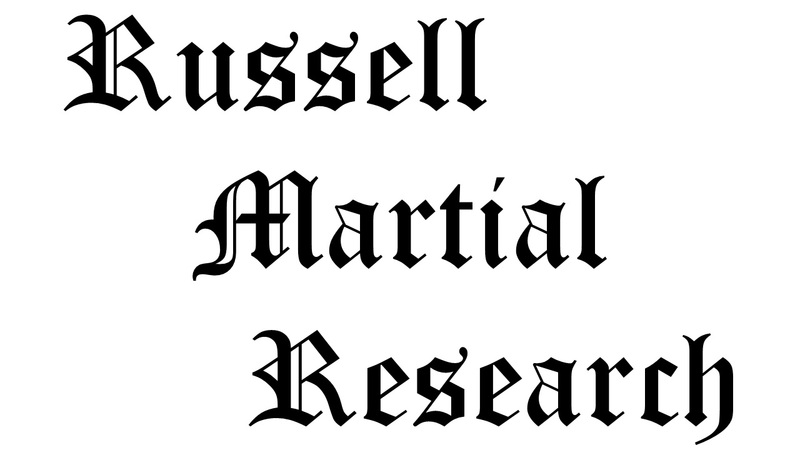 Citation for this article: Samuel L. Russell, “First Lieutenant Horatio Gates Sickel, Commander, E Troop, 7th Cavalry,” Army at Wounded Knee (Carlisle, PA: Russell Martial Research, 2015-2016, http://wp.me/p3NoJy-K3) posted 9 Aug 2015, accessed date __________. This entry was posted in Officers and tagged 7th Cavalry, 7th Cavalry Regiment (United States), Battle of Wounded Knee, Cavalry, Cavalry Troop, Drexel Mission, Fort Riley, Pine Ridge, Pine Ridge Agency, Pine Ridge Indian Reservation, Sioux, United States Military Academy, White Clay Creek, Wounded Knee, Wounded Knee Creek, Wounded Knee Massacre. Bookmark the permalink. This is an important account of Colonel Sickel’s life and career, with special insights into his service at Wounded Knee, including important information about other officers, as well. 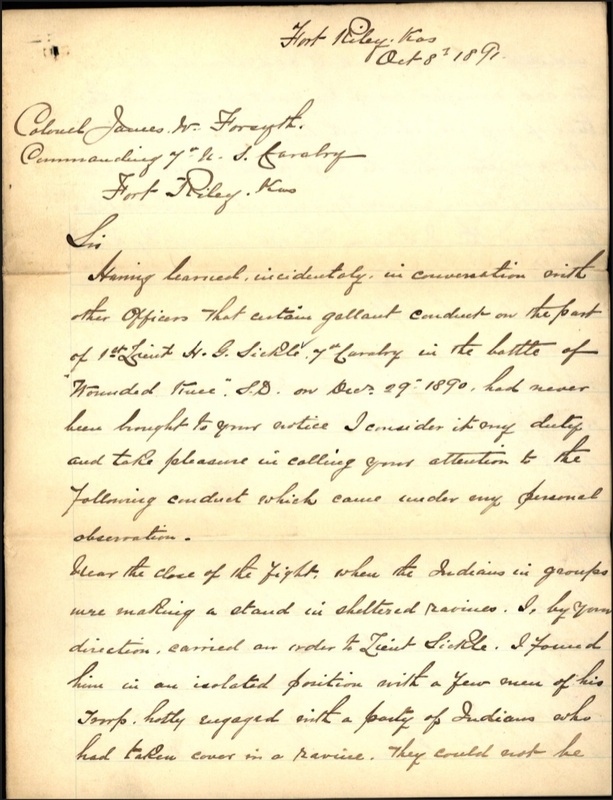 Thanks, again, Colonel Russell, for another significant record of a Seventh Cavalry figure’s participation at Wounded Knee using historically vital primary documents. A fine presentation, indeed. Although Colonel Sickel had no children that survived infancy, he did have a namesake. When he was a cadet at West point, his older brother and sister-in-law, William and Sarah (Locke) Sickel, had a son. Born 27 September 1874 at Philadelphia, Pennsylvania, they named him Horatio Gates Sickel, III. The name continued for at least two more generations. Horatio Gates Sickel, IV, was a 1920 U.S. Naval Academy graduate and pilot who was killed in action in 1944 in the Pacific theater. His son, Horatio Gates Sickel, V, also was an Annapolis graduate and a pilot. He too was killed on active duty in a test flight in 1956. Thanks for this well written article. CAPT HGS, IV was not a pilot but rather Surface Navy. He was killed off Funi Futi Island while a passenger in a Navy transport plane. My Uncle Bud, HGS, V was indeed a Navy Test Pilot killed in 1956. His brother and my father, John A (Jack) Sickel was also a USNA grad and Navy Test pilot. The name HGS is still carried to this day, at least in part. My son’s Name is Ryan Gates Sickel, his mother nixed Horatio..He served in the US Army in Iraq. Mr. Sickel… Thank you for the comment, and the brief synopsis of your family’s military history. Their service is most admirable and greatly appreciated. I have another contact via this site that is in possession of Col. H. G. Sickel’s saber. He would like to pass it back into the family. Do you mind if I have him contact you? before this. Wonderfully written and a great story. I will direct my siblings to you site to learn more about our “shirt-tail” relative. Thanks Sam. Thanks for the comment, Mr. Wisdom. A justifiably proud military heritage in the Sickel family.